Two teams of contestants gather around a microphone and a buzzer under bright stage lights, eagerly awaiting the next test of their knowledge. Behind them, a floor-to-ceiling screen displays tabulated points and an emcee, who launches into his first question as the audience awaits in hushed silence. “Question one is a pharmacology question. Most local anesthetic hyper sensitivity reactions are associated with the metabolism of ester agents to what substance?” Team number two is ready. “Para-aminobenzoic acid” says one contestant, and the crowd erupts in cheers as a point appears in the winning teams’ column. As you’ve probably already guessed, this isn’t Jeopardy. 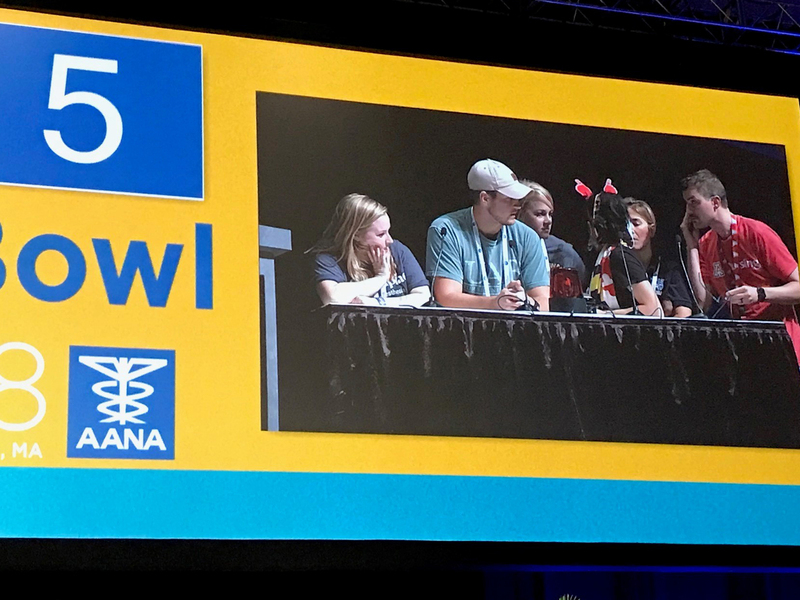 It’s the annual Anesthesia College Bowl, a lighthearted but academically serious test of knowledge held at the annual American Association of Nurse Anesthetists (AANA) Annual Congress. Founded in 1931, the AANA is the professional association representing more than 52,000 Certified Registered Nurse Anesthetists (CRNAs) and student registered nurse anesthetists nationwide. This year, the UA College of Nursing had the honor of having two Nurse Anesthesia students – Tim Markle and Michael Crosley – selected to compete. “It’s an honor to be nominated and chosen to compete in this Jeopardy-style competition against other students and faculty from across the country,” says Kristie Hoch, DNP, CRNA, Assistant Specialty Coordinator for the DNP-NA program. Held this year on September 24 in Boston, MA, the Bowl’s prime objective is to stimulate interest in the knowledge and current practices of anesthesia – and have fun in the process. The rules are simple: Six teams of students play each other, answering questions about anesthesia that have been submitted by nurse anesthesia program directors. The winning student team faces off against a team of six CRNAs to determine the ultimate winner of the College Bowl. This year’s event featured some stiff – and dramatic – competition but our UA CRNA students proudly represented our Wildcat Nurse community: After the scores were tabulated, Tim Markle was on the Runner Up team. He received a certificate and a T-shirt for placing second. Held this year on September 24 in Boston, MA, the Bowl’s prime objective is to stimulate interest in the knowledge and current practices of anesthesia – and have fun in the process. The rules are simple: Six teams of students play each other, answering questions about anesthesia that have been submitted by nurse anesthesia program directors. The winning student team faces off against a team of six CRNAs to determine the ultimate winner of the College Bowl. This year’s event featured some stiff – and dramatic – competition but our UA CRNA students proudly represented our Wildcat Nurse community: After the scores were tabulated, Tim Markle was on the Runner-Up team. He received a certificate and a T-shirt for placing second.